Since prehistory, humans have striven to tame fire and ice, and have braved the business ends of mashers, scrapers, and razor-sharp knives--all in the name of creating something delicious (or, at least, edible). The technology of food matters even when we barely notice it is there, but in recent years kitchen technology has become increasingly elaborate and eye-catching, transforming the old-fashioned home kitchen into a bristling stainless steel laboratory. 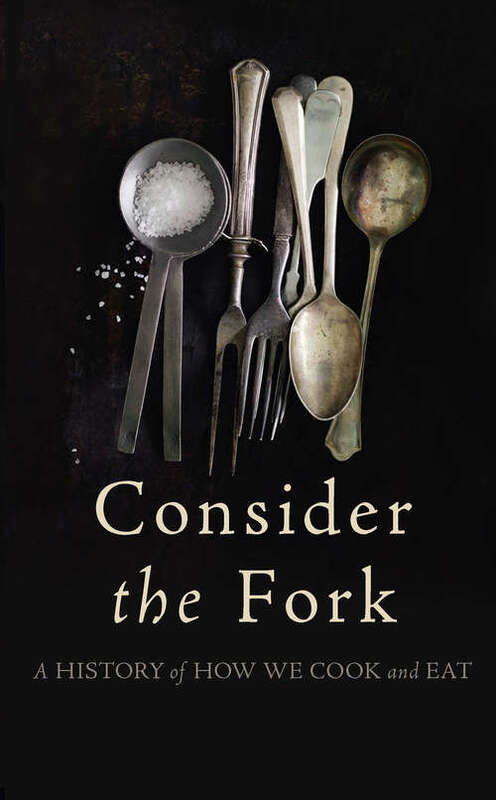 Far from a new development, however, the modern kitchen is only the most recent iteration of an ancient lineage of food technology, as acclaimed food historian Bee Wilson reveals in Consider the Fork. Many of our technologies for preparing food have remained strikingly consistent for thousands of years. The Greeks and Romans already had pestles and mortars. Knives--perhaps mankind's most important gastronomic tool--predate the discovery of that other basic technology, fire. Other tools emerged quite suddenly (like the microwave, whose secrets were unlocked during radar tests conducted during World War II) or in fits and starts (like the fork, which had to endure centuries of ridicule before finally gaining widespread acceptance). For every technology that has endured, others have fallen by the wayside. We no longer feel the need for andirons and bastables, cider owls and dangle spits, even though in their day these would have seemed no more superfluous than our oil drizzlers and electric herb choppers. The evolution of food technology offers a unique window into human history, and Wilson blends history, science, and personal anecdotes as she traces the different technologies that have shaped--or slashed, pounded, whisked, or heated (and reheated)--our meals over the centuries. Along the way she reveals some fascinating facts--showing, for instance, how China's cuisine, its knives, and its eating utensils are all the product of the country's historically scarce fuel supply. To conserve energy, chefs rendered their ingredients quick-cooking by using large, multi-purpose chopping knives to reduce food to small, bite-sized morsels. This technique, in turn, gave rise to the chopstick, which cannot cut. What's more, the discovery of the knife--in Asia and elsewhere--was likely what gave humans our distinctive overbite. Before humans learned to fashion knives out of sharpened rocks, many of us cut our food by clamping it in our front teeth, which gave us perfectly aligned rows of teeth. But Wilson shows that, far from being adventurous innovators, cooks are a notoriously conservative bunch, and only adopt new technologies with great reluctance. The gas range revolutionized cooking when it was first introduced in the 19th century by promising to end "hearth deaths," a constant danger for women wearing billowing, flammable clothing. But indoor gas cooking--safer and more efficient--was nevertheless greeted with widespread suspicion when it was first introduced. Many chefs feared it would taint their food or poison their guests. The same hold true for the refrigerator, which was initially condemned as an unnatural technology that risked changing the fundamental "essence" of food. Perhaps the one exception to this technophobia, says Wilson, was the egg beater, new patents for which proliferated so astonishingly in late 19th-century America. In this fascinating history, Wilson reveals the myriad innovations that have shaped our diets today. An insightful look at how we've changed food and how food has changed us, Consider the Fork reveals the astonishing ways in which the implements we use in the kitchen affect what we eat, how we eat, and how we relate to food.